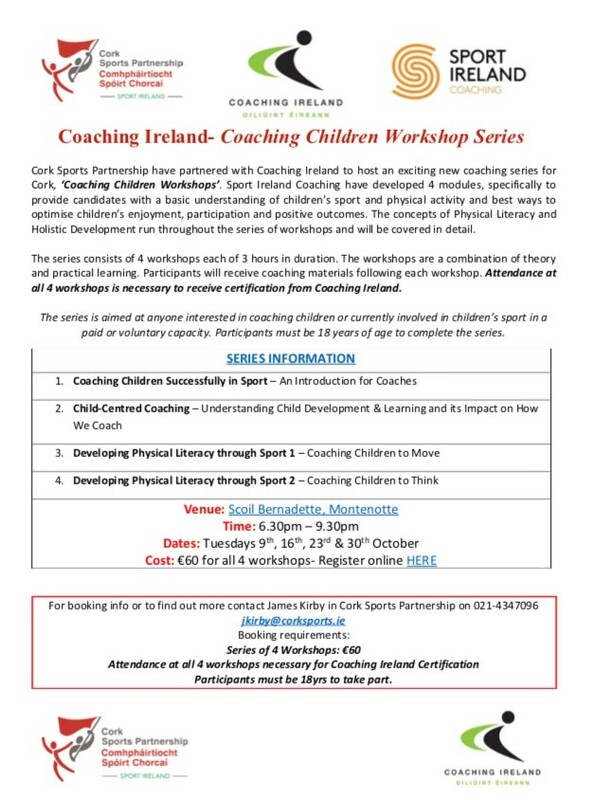 Cork Sports Partnership have partnered with Coaching Ireland to host an exciting new coaching series for Cork, ‘Coaching Children Workshops’. Sport Ireland Coaching have developed 4 modules, specifically to provide candidates with a basic understanding of children’s sport and physical activity and best ways to optimise children’s enjoyment, participation and positive outcomes. The concepts of Physical Literacy and Holistic Development run throughout the series of workshops and will be covered in detail. The series consists of 4 workshops each of 3 hours in duration. The workshops are a combination of theory and practical learning. Participants will receive coaching materials following each workshop. Attendance at all 4 workshops is necessary to receive certification from Coaching Ireland. The series is aimed at anyone interested in coaching children or currently involved in children’s sport in a paid or voluntary capacity. Participants must be 18 years of age to complete the series. Participants must be 18yrs to take part.